Sometimes it helps to ask if there’s anything you can do. A little over a year ago, Pigeon O’Brien, a longtime friend to many of us at Popdose, was diagnosed with multiple myeloma, a rare form of cancer that attacks plasma cells. It’s incurable, but treatable. Coincidentally, multiple myeloma has been in the news recently as a result of Tom Brokaw’s newly published memoir detailing his own battle with it. Shortly thereafter, Leslie Liberatore sent an e-mail to our founder, Jeff Giles, and me to express her sadness and to marvel at how Pigeon was dealing with this life-threatening news – at least on Facebook – with her wonderful sense of humor. Knowing that her medical bills would pile up, that question – “Is there anything we can do?” – came up. So often that’s an empty gesture. We’ve all heard it; we’ve all said it at various times. But Jeff immediately came upon the idea of a benefit CD. He had a handful of live performances from the Matt N’ Jeff Radio Hour and he and Matt would seek permission to release them. Within a few days, they had secured approval from about 10 artists. I contacted a few publicists and artists that I’m fairly close with to see if they could contribute any spare tracks, and other Popdosers did the same. There wasn’t going to be any particular aesthetic or theme – the idea, in Jeff’s words, was to produce a “crazy quilt.” All we asked it that not be a sad song. 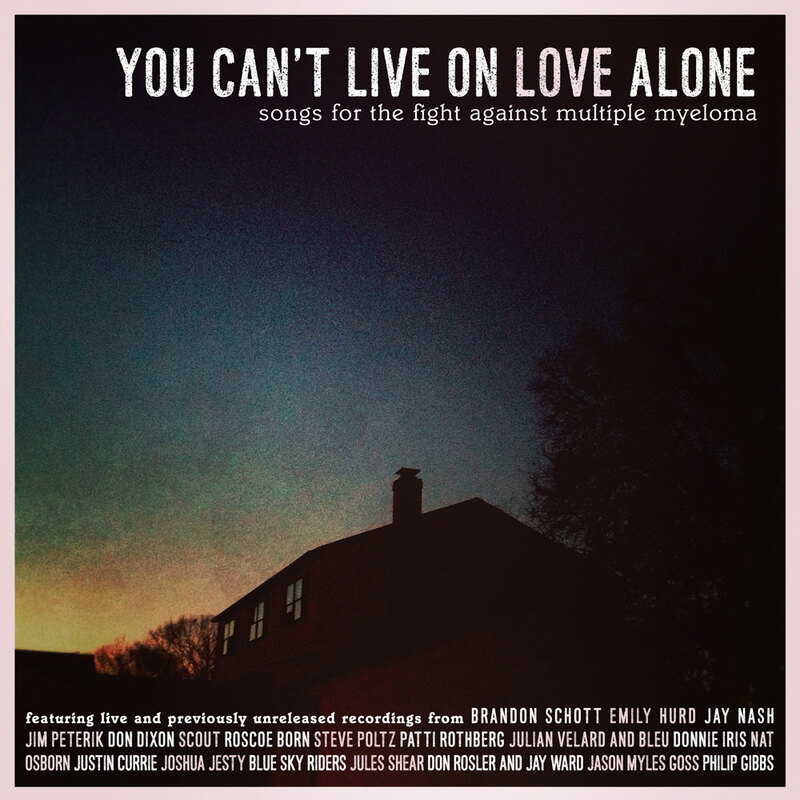 And now, we at Popdose are proud to announce that You Can’t Live on Love Alone: Songs for the Fight Against Multiple Myeloma will be available on June 2. It is a digital-only release, and can be pre-ordered for only $7.99 now at Amazon, with iTunes and Google Play to follow soon. The 19 acts range from indie artists to Grammy winning, multi-platinum songwriters and producers. Its title comes from the contribution by Justin Currie, the brilliant frontman of Del Amitri and includes songs by Jim Peterik, Don Dixon, Jules Shear, Steve Poltz and many other of our favorite musicians. The complete track listing can be found below. Our fundraising goal is two-fold. The immediate proceeds will go directly to Pigeon to help pay for her treatment, while the long-term money will go to the Multiple Myeloma Research Foundation. We thank all of the artists and publicists who helped make this a reality, as well as Jacob Detering at Red Pill Entertainment for production assistance, Matthew Ryan for the cover photograph and George Howard for his sage advice. But most of all, to Pigeon, for the remarkable strength and courage she’s shown us throughout her ordeal.